The United Church of Christ, Congregational, Burlington managed to take something that one would normally sit on, and turn it into something one would normally put on. When Gail Ciano, a Sunday School teacher, finished the curriculum section that encouraged the children to be good stewards of the earth, she thought it would be a nice idea to present the pastor with an item that illustrated how well the children learned their lesson. How better to endorse the curriculum than to create a useable item made of recycled materials? Ciano, who once transformed some donated upholstery samples into purses to be sold at a the church's annual Olde Tyme (craft) Faire, used that same ingenuity for a Sunday School project. The idea struck her to use the same materials for a stole for the minister. She went to a local Ethan Allen home furnishings retailer, and asked if she could have the discontinued upholstery sample squares -- which are normally thrown out and would most likely end up in a landfill. They were delighted to recycle them and put them to good use for a charitable endeavor. Ciano brought the fabric back to the church and asked the children to help design the stoles, harmonizing the different illustrations on the 14x14 squares (smaller when you cut off the labels) in order to create a cohesive pattern that would fit on a 5-foot long stole. The designs were based on being a good steward of the earth, and included symbols depicting God's creatures, fruits, recycling, and even one with a cross that has a leaf. She enlisted the help of a friend and quilter, Susan Eby, who worked with the children and did most of the sewing of the first stole. The children presented the stole to the pastor who absolutely loved the gift and the idea behind it. No one is really sure who came up with the suggestion to turn this idea into a fundraising endeavor, but quickly a team of ladies began creating "green" stoles to help support the church. About a dozen women volunteered their time and talents and sewed the stoles. They worked together regularly as their schedules allowed, frequently in fellow member Barbara Moran's dining room. This venture was more than a fundraising project, though; it turned into a fellowship program. "We had a lot of fun," said Ciano. "It was work, and it was a challenge to combine some of the pieces of materials, but overall it was a great experience and brought us closer together. Instead of just saying hello at coffee hour, we became much better friends. It was a joy." The concept of recycling and re-using was not lost during the project. When appliqués, extra fabric, or backing was needed, the ladies did not run out to the nearest crafts store. "We put the word out and people went into their closets and found materials they had long forgotten or no longer were useful." At one point they pursued fabrics from another Burlington furniture store. "It became a challenge to avoid going outside and buying new stuff," she said. "That was part of the fun of it." 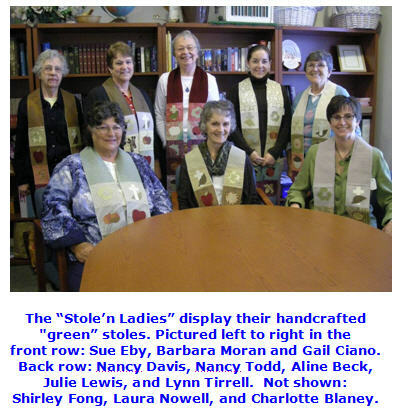 All in all, the "Stole'n Ladies" of the United Church of Christ Congregational in Burlington handcrafted over 40 ministerial stoles to be sold as a church fundraiser. As of this writing, about 15 "green" stoles have been sold for $95 each plus shipping -- which the ladies believe is the going rate for similar handcrafted stoles. Ten percent of the proceeds are split between Our Church's Wider Mission and Heifer International. "We didn't want to price them so high that people wouldn't buy them; however, we also wanted to raise money and to recognize that each one is a unique work of art," said Ciano. "And we want to see our stoles out there. We would be tickled pink if lots of ministers were wearing them because of the message -- all about caring for God's earth. This is a project of love." For more information about the program or to inquire about purchasing a stole, contact Gail Ciano of the Stole'n Ladies at 781-229-9757 or gail.m.ciano@gmail.com.